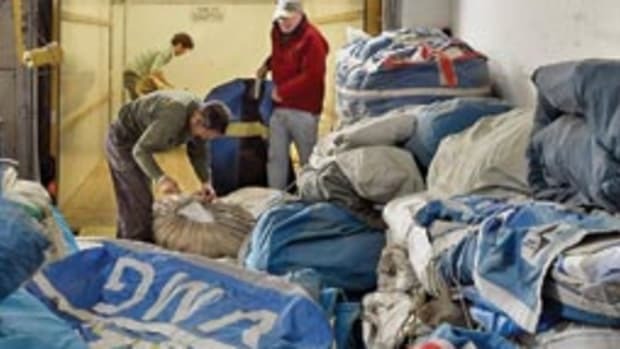 Maine sailor John Eide is organizing a drive to collect used sails to be shipped to Haiti for use in makeshift shelters. "The rainy season is starting early this year in the Caribbean, so the faster we can get our used sails to Haiti, the better off the estimated 770,000 homeless will be," he said in a request for assistance. Maine Sailing Partners and Pope Sails & Rigging are all drop-off points for the sails and Portland Yacht Service will accept sails during the Maine Boatbuilders Show. The sails will then be trucked to Miami where two organizations, Haiti-Life and Shake-a-Leg, have the infrastructure in place to ship the sails to Haiti. The deadline for donations is March 19.